Suryauday Haveli Heritage Hotel on Shivala Ghats is your choice if you wish to stay in a high-end historic hotel on the banks of the river Ganges next to the famous Ghats, capturing the spirit of the holy city of Varanasi. 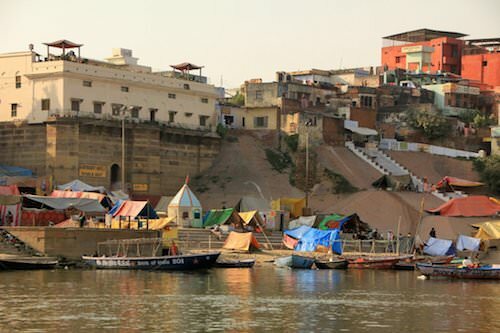 Known also as Benares (its other name is Kashi), it is one of the oldest living cities in the world. According to the ‘Vamana Purana’, the Varuna and the Assi rivers originated from the body of the primordial Person at the beginning of time itself. The tract of land lying between them is believed to be ‘Varanasi’, the holiest of all pilgrimages. The word ‘Kashi’ originated from the word ‘Kas’ which means to shine. Steeped in tradition and mythological legacy, Kashi is the ‘original ground ‘created by Shiva and Parvati, upon which they stood at the beginning of time. Varanasi is a microcosm of Hinduism, a city infused with traditional classical culture, glorified by myth and legend and sanctified by religion. It has always attracted a large number of pilgrims and worshippers from time immemorial. To be in Varanasi is an experience in itself, one of self–discovery, an eternal union of body and soul. To every visitor, Varanasi offers a breathtaking experience — a bewildering mix of contrasts — between the sacred temples and the terrible filth of a crowded Indian city where cows and dogs roam freely, of Hindu devotees praying in temples and the rambunctious activity of merchants selling jewellery, sari cloth and cell phones. If you stay at the Suryauday Haveli, you can rise at dawn to witness the rays of the sun shimmer across the Ganges, gaze upon the high banks, the temples and shrines along the river bathed in a golden hues. Listen to soul-stirring hymns and mantras drift along with the fragrance of incense filling the air. You will also see women washing clothes and men taking a refreshing dip in the (not so clean) waters of the Ganges in the early morning hours. Suryauday Haveli traces its history back to the early 20th century, when it was built by the Royal Family of Nepal as a retreat for the elderly. It has now been painstakingly renovated to provide the best ghat experience in Varanasi. Your stay at Suryauday Haveli begins with a 15-minute boat ride upstream along the famous ghats until you reach the haveli. The Suryauday Haveli is also connected by a network of small alleys and streets leading to the famous Kashi Vishwanath Temple. Start your day with yoga on the Roof Terrace under the supervision of Suryauday Haveli trained instructors. Sit back on the roof deck and soak in the spirit and legacy of the Ghats or take a walk through the old city with all its noises, smells, colors and masses of people. Suryauday Haveli comprises of one river facing master suite, eight river facing rooms and five en-suites, each fitted with an attached bath, air-conditioning, and WiFi. The hotel restaurant offers Indian food and local mouth watering specialities including Dum Aloo Banarasi, Makhmali Kofta, Methi Malai Mutter, and more. Outdoor seating is in the courtyard as well as the Roof Top Terrace, where light snacks and beverages are served-probably the best location in the city to catch the evening sunset and daily Aarti.